Several weeks ago Volker Weber (one of the most popular and divergent bloggers in the community) blogged about XPages and its future. Community has discussed lot about this issue. Many partners build their incomes from application development but IBM is targeting more license income, naturally. 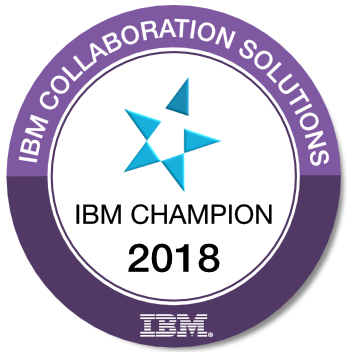 In recent years, IBM invested heavily on its messaging features and other collaboration applications. Although they also provided an important tool for development (XPages), marketing campaigns did not emphasize XPages enough. Last week, at the IBM Software Summit, I found myself in the middle of an intense discussion between a partner and an IBMer. The topic was the same: "If IBM does not invest in marketing RAD features, many partners will go out business, evantually..."
This discussion will continue forever I think. There is a global strategy, a huge owner of that strategy and a bunch of people claiming that it's wrong. Tough! One missing part of the discussion should be underlined here. IBMers always have an answer to give because an average IBMer at the sales/marketing side is dealing with Lotus for a couple of years. However, an average 'antagonist' partner is in the same business for a decade. So partners have problems with 'trust'. Think of Lotus Foundations as an example. IBM created this product to target micro/small business segments. Some partners aligned themselves for this new strategy. Naturally, a partner targeting SMB segment has to revise some structures to focus a smaller segment. Now there is an ambiguity in this product. Hardware appliance has been abondened quietly. Analyzing this specific example is not the subject of this entry. But my point is the trust issue. How can anyone expect partners to align with IBM's strategies? I hate the saying about 'seeing the empty part of a glass'. But the case fits. I am clearly on the same side with many partners that demand more marketing on the application development features. In our Turkish market, Microsoft is very powerful.Today we had the chance to discuss about MS strategies with Esra, Lotus brand executive of Turkey. We talked about Enterprise Agreement scam, which has a great negative influence on our business. I think the most effective bullet we have is the unique ability of Lotus Domino, easily developing awesome web 2.0 applications via XPages. If the speculation about WAS-based XPages is true, it would never be a good replacement for Domino environments. I don't feel a new Workplace adventure different than many others. I had some experience with WAS platforms and there are many advantages of Domino server that cannot be compared. WAS-based XPages may be a good way to develop simple portal pages without using complicated Rational Application Developer tools. It may also help customers to programmatically customize WAS-based Lotus products such as Quickr, Connections, Mashup, etc. Application developer partners are alone at the current picture. We will be hearing 'good work' and 'go on' motivations in this period. There are two distinct possibilities here: We may do marketing ourselves, or we focus standalone products developed on Domino, targeting specific problems. This is a large issue and will be discussed many more times. I think IBM has been late to show its commitment about Lotus Foundations as an application development environment. But in a partner point of view, you are absolutely right. Nitrix is an excellent environment to develop custom applications (Domino + non-Domino) and deliver them as a complete appliance solution. However, It should be supported at the hardware-level. Because I saw and heard some hardware-specific compatibility problems in current deployments. So, the recent announcement shocked me! I would like to meet you if I may participate in LS2011 and discuss further details about your effort. I have been an advocate of Domino on Foundations since "Nitix Blue" -- and have voiced my opinion that, without Applications, the platform is basically an email server, which, cannot survive in today's marketplace. Now, I know this is Taboo, but, I submitted an Abstract for Lotusphere 2011 whereas people can learn about the many Application Development possibilities for Lotus Foundations, covering a wide range of options and application possibilities (i.e. not 'just' Domino). While I am not sure that this will be accepted, I can say that people need to know about the exceptional SMB development platform that Lotus Foundations brings to the table -- without the basic knowledge, I am not sure if the platform can survive. I totally agree with you. WAS-based XPages will leverage this functionality and our knowledge base. I just talked on myself, but I know you're right. Other developers are also uncomfortable with this situation. The impact of IBM's inability or unwillingness to effectively play up Domino's RAD capabilities in the marketplace is not limited to business partners. Notes/Domino developers inside organizations have been on the defensive as well, as JonVon's epic poem on this topic earlier this year illustrated all too well. We're all tired of watching our employers/clients burn money on silly "BIG IT" adventures when all too often a better/simpler/cheaper Notes/Domino option is staring them in the face. All largely because IBM haven't bothered to point it out in a way they'll ever notice, either through "air cover" or at the retail end. I think that the possibility of XPages existing on WAS is something additional to the fact that XPages live on Domino right now. IBM has rewritten all the Notes classes to SSJS and the only datasource right now is .NSF. I think the effort, from IBM, is big enough to think that XPages will live in Domino for a long time. But if XPages, in a speculative future, can be used in WAS also, I think it could be a good thing for investments done in the technology as you could target more platforms/customers at the same time. Making XPages available on Websphere would be a good thing to me. If it would run on JBoss or even Tomcat that would be even better.